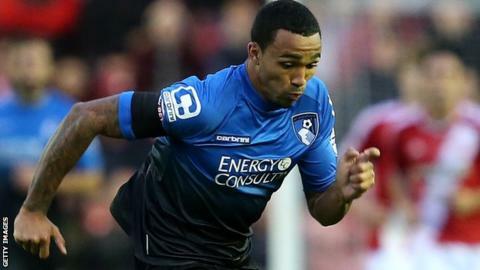 Cardiff City manager Russell Slade has revealed he recommended striker Callum Wilson to Bournemouth boss Eddie Howe. Wilson joined Bournemouth on a four-year deal for an undisclosed fee from Coventry City in July. The 22-year-old has already scored 11 goals for Howe's side this season and is set to face Cardiff in the Championship on Saturday. "It's partly my fault for recommending Wilson to him [Howe]," Slade said. "He's taken him and he's done a fantastic job for him." Slade, then Leyton Orient manager, recommended England Under-21 international Wilson to his good friend Howe during the summer. Howe, 37, is in his second spell with Bournemouth following a brief stint in charge of Burnley, and Slade admires the work he has done with the Cherries. Bournemouth are unbeaten in their last 10 league games and are third in the Championship, six points ahead of ninth-placed Cardiff. "We talk football over the phone quite a bit and we talk about players. We do respect each other," Slade added. "It's not surprised me personally that they're up there. "They're a group that have been together for a good period of time now. "They're well drilled, they know what they're doing and know each other's strengths and weaknesses. "They're punching above their weight in many respects and it's a real tough assignment for us. But they're there to be knocked down. "We'll be doing our best, like we did when we went to Watford, to get a positive result." Cardiff's win at Watford on 29 November was their first away victory of the season and Slade admits results over the busy Christmas period could define their season. Slade's side are home to Brentford on 20 December before travelling to Charlton on Boxing Day and hosting Watford two days later. "They're difficult fixtures but there are no easy fixtures anyway," Slade said. "It does appear we perform well against those teams that are really going well at the top of the league and in terms of that we have no fear going to the likes of Bournemouth. "We know we are capable. "We've set ourselves short term targets. We know exactly what we need to do and whether we're on track on we're not on track."